SureFire is laying the foundation for a post-Wi-Fi world. Its new platform, ARON, is a communications system designed to transmit real-world data via infrared light, allowing users to access an augmented reality view of their immediate surroundings. It's a lot like Google Lens -- but it doesn't rely on Wi-Fi, cellular data, geolocation or orientation tools. ARON stands for "augmented reality optical narrowcasting" and it's able to transmit any type of digital file format, including high-definition video and images, up to 400 meters during the day and 1,200 meters at night. 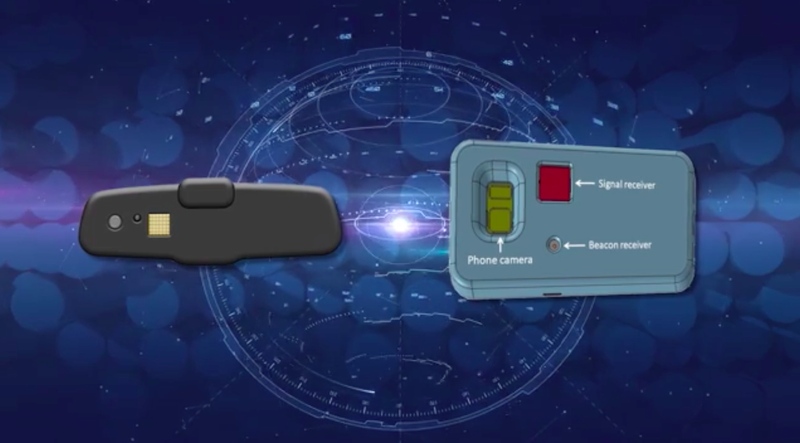 The data travels on square beams of infrared light, creating a secure connection between the device -- whether a smartphone, car, computer or wearable -- and the sensor in the real world. Ditching Wi-Fi and data creates a secure connection, but it would also come in handy wherever internet connectivity is weak or nonexistent, and in the face of natural disasters, which typically wipe out Wi-Fi. SureFire imagines a few happy scenarios where ARON could be handy, too: It would allow visitors to see information about stores or restaurants while walking around a foreign city (typically without a data plan). Or, baseball players could wear sensors allowing fans with smartphones or AR glasses in the stadium to see their stats, superimposed directly over their bodies as they run around the field. ARON isn't something that can be rolled out on a massive scale overnight. It would require sensors on buildings, athletes, highways, cars and anything else that needs to transmit data. Plus, smartphones and other devices would need the proper receiver. Right now, ARON exists in a limited demo form. Dr. Narkis Shatz, one of the inventors behind ARON, said one thing needs to happen for this ecosystem to take off: A major provider of electronic communication (think Verizon, Comcast or AT&T) has to invest in it. SureFire revealed ARON at CES and the company is in Las Vegas for the week, showcasing the technology at the IEEE booth, hoping to lure big-name investors.